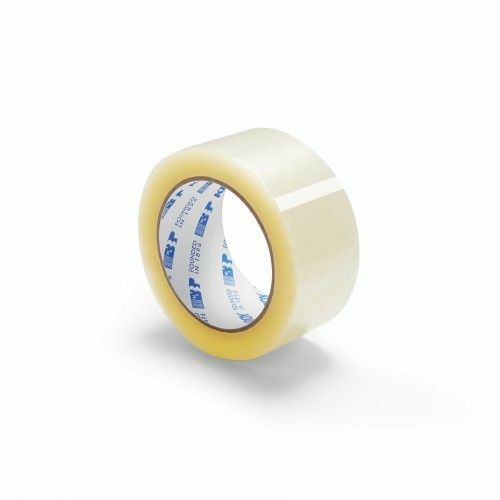 1.6 Mil - 2" x 110' Hotmelt Adhesive - Sealing Tape With 36 Rolls Per Box	... read more. General purpose packaging tape used for box sealing, splicing and other packaging applications. This product has a conformable film backing coupled with a pressure sensitive hot melt adhesive coating. This system allows for high adhesion and holding power. Use with a dispenser (not included) or for manual sealing. Recommended one-year shelf life from date of dispatch if kept at moderate temperatures and humidity levels. Store in a clean, dry place. Temperature of 40-80ºF (4-26ºC) and 40 to 50% relative humidity are recommended. 36 rolls (110 yards) per box. Minimum order of one box.